Sidelighting – light coming from the left or right of a subject. Because the light is scraping across from side to side, it catches every surface blip and imperfection, leaving a trail of large and small shadows and exaggerating surface textures. Sidelighting brings out textures on surfaces like on this leaf a ladybug is climbing on along a trail at the Beaver Lake Nature Center near Baldwinsville, New York. Photographers must be very aware of the direction of light. One direction which is often overlooked by new photographers is sidelighting. Sidelighting gives an almost three dimensional effect to a subject as shadows bring out surface textures almost hidden when light is straight on. It adds drama and depth even to a ladybug climbing on a leaf. Photo taken with a Nikon D70 digital camera and Nikon 18-200VR lens at 1/80s, f/5.6, ISO 200, EV +0.7, 200mm focal length, hand-held, no flash. This entry was posted in Nature, Photography and tagged 18-200mm, baldwinsville, beaver lake nature center, bokeh, direction, green, insect, ladybug, leaf, new york, nikon D70, red, sidelighting, veins, vr. Bookmark the permalink. I love it; a very clear and simple motive, very good light effect, and a great color contrast. A happy photo. Birgitte, I liked how you called it a happy photo. I even used that in my tweet this morning. Beautiful, thanks for the tips. I’ve noticed this more and more and by the time I look at the picture in my computer, it’s too late. Thanks, Nye. When I have time and I am able, I try to look at what I am photographing from a few different angles to see how the light changes. Thanks, Tracy! Don’t you love it when complementary color elements come together like this. Without the ladybug, this is a boring photo of a leaf. I took this photo in mid-afternoon. The sidelighting came from the leaf being in the shade so the light was being reflected from a clearing off to the right. Thanks for the tip! Very cool photo. When I can, I like to change the angle I take a picture from just to see which angle makes it look the most “pretty”, for lack of a more professional sounding term. Pretty is a professional term. 🙂 Looks like you got sidelighting figured out with the Iris post of a few days ago. A happy photo indeed! I had accidentally discovered that sidelighting–what I’ve been thinking of as light on a slant–created a very nice effect. Now I understand better why that is. One of my favorite things is to capture the reflection of light from water into the woods. I think this post will help me figure out how to do that successfully more often. Thank you! You’re most welcome, Gerry. Happy accidents are fun if you can remember how to do it the next time. Sounds like you can. Got an example of the reflection of light from water into the woods? Not sure I understand what that is. Great photo! I really like the details of the leaf… and all that green makes the ladybug pop. Itching, yes. Will be playing with an inexpensive macro technique and will share my results when I do. I love sidelighting and do not use it enough. 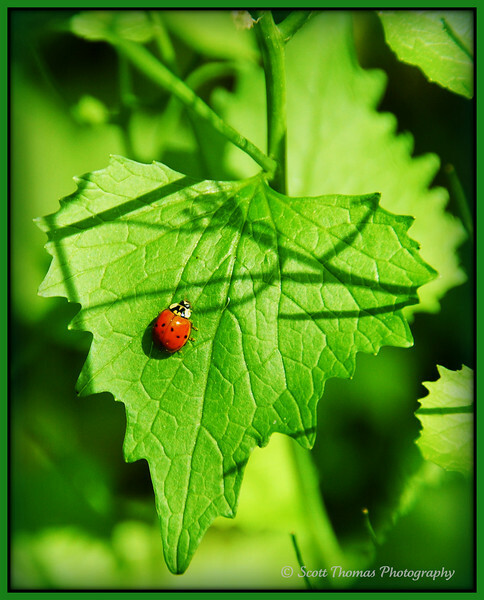 Your ladybug on the leaf photo is a perfect example of what sidelighting enhances and brings out in light and shadows as this definitely brings out depth. Sidelighting photography is what I’d like to do more of in the evening and twilight hours during the summer time (among the insects including mosquitoes!). Sidelighting is something which either is right there or hard to visualize or even find. Today I tried to find some on the beach but the Sun was just too high in the sky during the time I was there. I’ll be going back later in the day when the Sun is lower as you suggest. Thanks, Truels. I think sidelighting would make some of your flower photos very dramatic. What a marvelous photo–vibrant and filled with light. You have a way of making the simple profound. Thanks for the your informative content. I always learn from you. Thanks, MJ. Sometimes the simple gets overlooked.